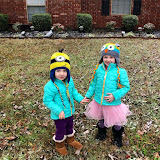 This week, Evie got to attend her first Valentine party. She didn't have a clue it was a party, but she certainly enjoyed playing with the kids. ;) The next day, I thought it would be fun to have a "red day" and work on some tot school together. So for our first round of tot school we learned about the color red. 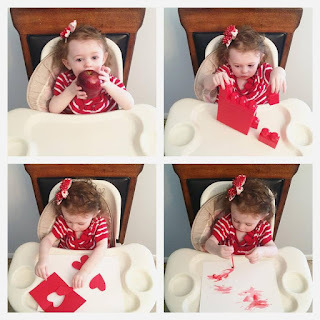 We put on a red dress, ate a red apple, built a tower with red blocks, colored with red crayons, made red crafts, and used red water colors. Then throughout the day, I would point out other red items. It was fun! I'm ready to figure out another fun "color" day at home. I miss those days. Enjoy it!